For right-handed golfers, a golf glove is worn on the left hand. The opposite is true for left-handed players. Because gloves are so popular today they are as much a part of the golfer’s outfit as shoes with spikes. It may be somewhat surprising to learn that wearing a glove when playing golf was not the norm for some of the game’s legendary players in the 19th and 20th centuries. Golf gloves made their first appearance on the market in the late 1800s. It was developed to address the problem of slippery golf club grips. The wooden-shafted clubs of the time had grips made of strips of leather that were wrapped around the top of the shaft. Humidity or dirt on the grips made it difficult for golfers to maintain a firm hold on the club. Gloves also protect the golfer’s hands from wear due to extended practice or playing sessions, which cause painful blisters and calluses. Despite their utility, golf gloves did not gain popularity among the buying public in the early part of the 20th century. Photographs of major golf tournaments reveal that the top players, including Walter Hagen and Bobby Jones did not wear gloves. Because amateurs emulate the style of pros they admire, the average golfer did not gravitate to wearing gloves either. Club makers worked hard to develop grips that provided more security. Gloves were still somewhat of a novelty. Glove styles at this time included fingerless and backless versions. A change in the pros’ perception of gloves occurred when one of the top players of the 1940s, Sam Snead, began wearing them in competition. They didn’t gain universal acceptance because the other top golfer of the era, Ben Hogan, continued to compete without wearing a glove. 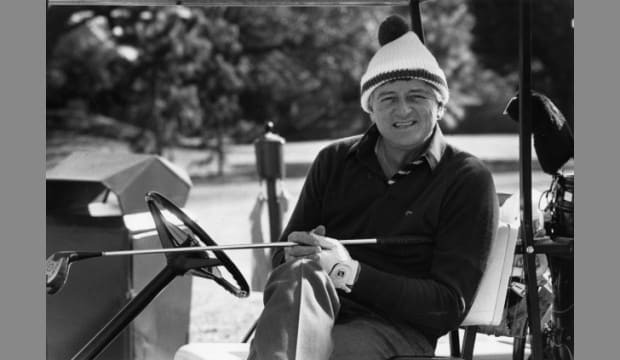 The early 1960s brought two new golf champions to the forefront, Arnold Palmer and Jack Nicklaus, who both had worn gloves since they began competing in amateur tournaments. Palmer’s habit of removing his glove when preparing to putt the ball was emulated by amateurs everywhere; he made the gesture seem “cool” at a time when golf was soaring in popularity. In the U.S. the FootJoy company entered the glove market in 1979, and began working with Pittards in 1980. FootJoy’s soft, comfortable cabretta leather gloves became one of the most popular brands. As of 2010, FootJoy estimates that 85 percent of all golfers wear gloves. Among PGA tour pros, the average is even higher, nearly 95 percent. One notable exception is major championship winner Fred Couples, who believes he gets better feel for the golf club without a glove on his left hand. 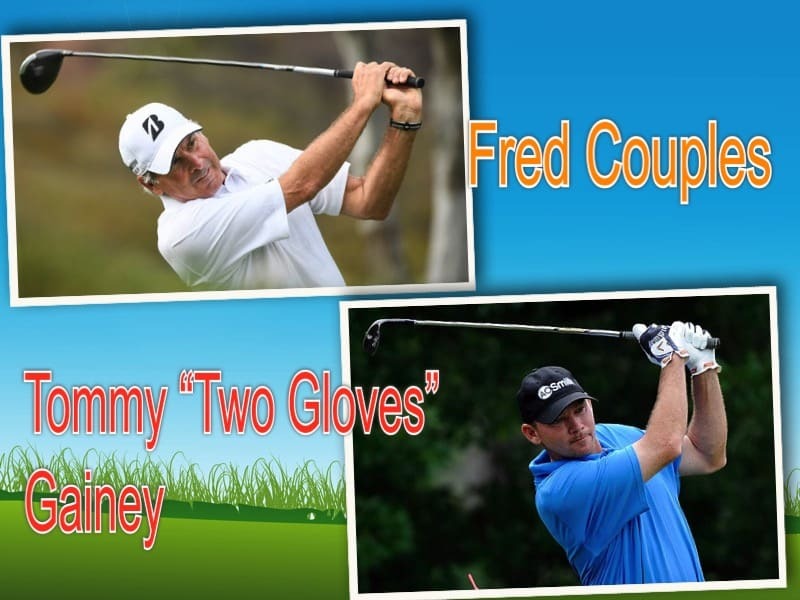 While former Golf Channel “Big Break” contestant and touring professional Tommy “Two Gloves” Gainey helped start a trend by wearing a golf glove on his dominant hand. Did you know? Golf may be the first sport to utilize tight-fitting gloves for protection and improved grip! Most current baseball fans know Ken “Hawk” Harrelson as the colorful color commentator for the Chicago White Sox. Harrelson was also an avid golfer who served as a platoon player with the Kansas City Athletics in 1963. According to an MLB.com story, that year he had played 27 holes of golf prior to a game against the New York Yankees in which he wasn’t slated to compete. A change in starting pitchers forced him into the lineup. As legend has it, Harrelson helped introduce tight-fitting hitting gloves into baseball when he realized he had a golf glove in his back pocket and put it on to gain protection from the blister suffered during batting practice. He slugged two home runs that game. Eventually, glove manufacturer Franklin asked Harrelson to endorse batting gloves. Why do golfers wear a glove on one hand? The key reason to wear a golf glove is grip. A golf glove is tackier than skin, particularly in hot weather, and will help to prevent the club from turning in a player’s hand. Gloves also help create more friction between the grip and the gloved hand. Exodus Golf strives to ‘evolutionize’ and educate the golf industry, by creating products and services for golfers that are motivated in elevating their game through science and forward thinking. They released their first product in May 27, 2016 the Neurogrip golf glove. The company was founded by Jason Gage. There are some features of this glove that make it unique and different compared to the regular golf glove. 1. It is a 3 finger golf glove. 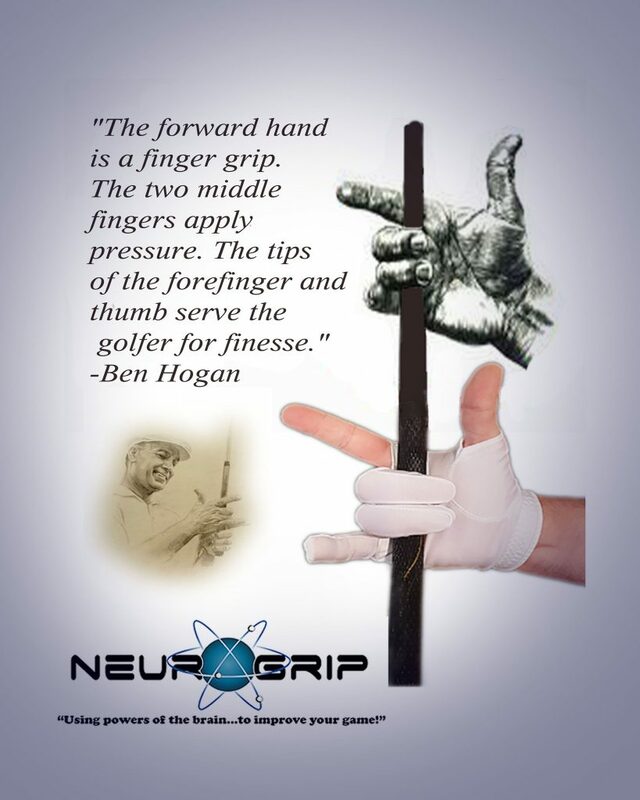 Therefore, the Neurogrip leaves the forefinger and thumb exposed in order to keep the feeling needed for finesse, and enhance the awareness one gets from the more sensitive fingers. This is also to help create the “neuroplasticity effect”. We will discuss neuroplasticity in the below section where we talk about how our hands work. 2. The glove is a combination of Lycra and cabretta leather. The placement of these materials in the glove serves a specific purpose. -Cabretta leather is made from the skins of sheep that grow hair rather than wool. It is tougher than other sheepskins and used chiefly for gloves and shoes. -The purpose of the leather in this glove is to improve grip, prevent slipping and improve feel. For this reason it is in the areas of ring finger, middle finger and upper palm pads. These are the areas where the grip makes contact with the golf club. -Contrary to the Cabretta leather, the areas where it is Lycra on the glove helps to reduce friction and assist with grip pressure. The thin Lycra material allows more sensitive feedback compared to a regular glove. In order to understand Neuroplasticity I will first go over how our hands work…. Your hands are part of the somatosensory system which produce sensory feedback whenever you come in physical contact with your environment. Most of the tactile feel we receive is gathered by 4 types of mechanoreceptors which are found in the layers of the skin. 2-“Meissner corpuscles” are specialized for controlling hand grip.They also fire only when a stimulus is first applied and then when it is removed. For example, when you grab a glass of water they fire and once again when you let go of the glass. 3-“Ruffini corpuscle” is sensitive to stretching of the skin and much like Merkel receptors, it fires continuously to stimuli. 4-“Pacinian corpuscle” respond to very fine detail by moving fingers, such as reading Braille. They are also selective to vibrations. They are similar to Meissner receptors in the way they fire and send signals. They act like an on/off switch that responds when a stimulus is applied and again when it is removed. All these receptors send signals to the spinal cord and eventually a part of the brain called the somatosensory cortex in the parietal lobe. How the brain changes based on this feedback is neuroplasticity. Neuroplasticity is defined as “the change in neural pathways and synapses that occurs due to certain factors, like behavior, environment, or neural processes. During such changes, the brain engages in synaptic pruning, deleting the neural connections that are no longer necessary or useful, and strengthening the necessary ones.” You and your plastic brain are constantly being shaped by the world around you. Everything you do, everything you encounter and everything you experience is changing your brain, and that can be for better, but it can also be for worse. So is the Neurogrip neuroplastic? Yes, but so is everything else! There is overwhelming evidence that every night after you learned stuff during the day, memories of the day are replayed and rebroadcasted back out from the hippocampus to the rest of your cerebral cortex. Rehearsing these memories again, strengthens the connections. Therefore, if you want to improve learning getting a good nights sleep is very important. What we know about the brain is changing at a breathtaking pace and much of what we thought we knew and understood about the brain turns out to be false or incomplete. Some of these misconceptions are more obvious than others for example we used to think that after childhood the brain did not, could not change. It turns out that nothing could be farther from the truth! We’re actually making thousands of new brain cells every day. You can double or triple the number of brain cells that you make next week by doing physical exercise. Even when you’re at rest and thinking of nothing your brain is highly active. Its the advances in imaging technology such as MRI (Magnetic resonance imaging) that allowed us to make these and many other important discoveries. Perhaps the most exciting, the most interesting and transformative of these discoveries is that every time you learn a new fact or skill, you change your brain. The primary driver of change in your brain is your behaviour; nothing is more effective than practice at helping you learn. In other words, there is no neuroplastic drug you can take. Research has shown that increasing difficulty during practice actually leads to more learning and greater structural change in the brain. We’ve learned that there is no one size fits all approach to learning. Consider the popular belief that it takes 10,000 hours of practice to learn and to master a new motor skill. I can assure you its not quite that simple, for some of us its going to take a lot more practice and for others it may take far less. The shaping of our plastic brains is far too unique for there to be any single intervention thats going to work for all of us. To optimize outcomes each individual requires their own personalized intervention. We put the glove’s claims to the test by performing nine case studies and six launch monitor test’s. -Providing verbal feedback on sensations experienced and preference after hitting shots with 4 different glove setups. -Each session consisted of a golfer hitting a driver, mid-iron and wedge five times with and five times without the Neurogrip. True or False: True, any barrier between the skin and grip will add protection for your hands and prevent blisters and callouses. True or False: ? This claim is very hard to prove or disprove. Claim: “The reason that most golf instructors and professionals don’t wear a glove on the dominate hand is because they believe that it will reduce the amount of ‘feel’ or feedback. By isolating and exposing the forefinger and thumb, and lightly covering the remainder of the hand, you get an increased sense of awareness in the fingers that feel the most. This awareness allows you to sense every motion made by your hands during the golf swing. True or False: True, based on our launch monitor testing we saw a major change in direction with the Neurogrip compared to the regular glove setup. This demonstrates an enhancement of awareness and greater accuracy. Interestingly, most testers did not feel the neuroplastic effect even though there was a significant launch monitor data difference. Other testers that experienced a difference in feeling stated it would disappear the longer the glove was worn. We recommend using the glove when you are having trouble straightening out your shots; just put it on and the Neurogrip will do the rest. In other words, use it more like a secret weapon when you are having trouble with accuracy. True or False: False, based on our launch monitor testing we did not find a significant increase in distance. The launch monitor testing was a short study and with long term use it may help to increase distance. The reason is because your brain can change in 3 ways to support learning. Chemical; your brain functions by transferring chemical signals between brain cells known as neurons. This triggers a series of actions and reactions. To support learning your brain can increase the amount of the concentration of these chemical signalling thats taking place between neurons. These changes happen rapidly so it supports short term memory or the short term improvement in the performance of a motor skill. This could account for the changes we saw in the #3 claim (enhance awareness/greater accuracy). Altering its structure; during learning the brain can change the connections between neuron’s. The physical structure of the brain changes so it take’s a bit more time. These types of changes are related to long term memory, the long term improvement in a motor skill. For example, when we learn a new motor skill such as playing golf for the first time. We’ve had the experience of getting better and better within a single session of practice and thinking, I have got it! Then maybe we return the next day and all those improvements from the day before are lost…what happened ? Well in short, your brain was able to increase the chemical signalling between your neurons but for some reason those changes did not induce the structural changes needed that are necessary to support long term memory. Keep in mind long term memories take time. During our launch monitor testing that’s exactly what we saw, the testers displayed a difference in direction between their normal glove setup and the Neurogrip. The directional control could reflect the chemical change or short term learning and with longer consistent use functional changes may occur which could produce distance changes. Altering its function; as you use a brain region it becomes more and more excitable and easy to use again. As your brain has these areas that increase their excitability, the brain shifts how and when they are activated. With learning we see that whole networks of brain activity are shifting and changing so neuroplasticity is supported by chemical, structural and functional changes. True or False: True, many products incorporate Lycra especially skin-tight garments because of its elasticity, strength, ability to return to its original shape after stretching (stretching up to five times its length) and its faster drying than ordinary fabrics. A number of golfers in our study found that there was better connection, but some golfers did not. We are far too unique for there to be any single intervention thats going to work for all of us. To optimize outcomes each individual requires their own personalized intervention. We have learned that there is no one size fits all approach, the best advice I can provide is to try the glove and see if it provides a benefit to you. 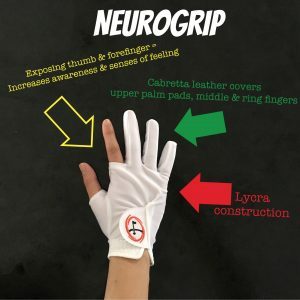 -Case study: When golfers hit balls wearing just the Neurogrip (not wearing a glove on the non-dominant hand), they found a sensation of slipping. The Neurogrip as a standalone glove is not enough traction if your hands get slippery. If the rear hand begins to slip, so will the bottom hand. We found for optimal results to prevent slipping the Neurogrip should be worn in combination with your regular glove. -Launch Monitor study: A few golfers mentioned they felt some slipping. We contacted the company and they informed us that it could be for 2 reasons, sizing issue or grip flaw. Sizing issue: Lycra can stretch up to five times its original length. We recommend ordering one to two sizes smaller than your usual size. Grip flaw: If the slipping occurs before impact, I would say to take a close look at the players grip first. A good golf grip should have no extra adjusting or movements during the swing and may indicate that the Neurogrip has exposed a grip flaw. If the slipping occurs after impact, doesn’t matter because the ball would already be gone. A proper fitting golf glove should fit like a second skin, tight across the palm and fingers, with no loose material. You should not have extra material at the top of your fingers. The wristband should fit securely at the base of the hand. This ensures a snug fit of the entire glove over the whole hand. 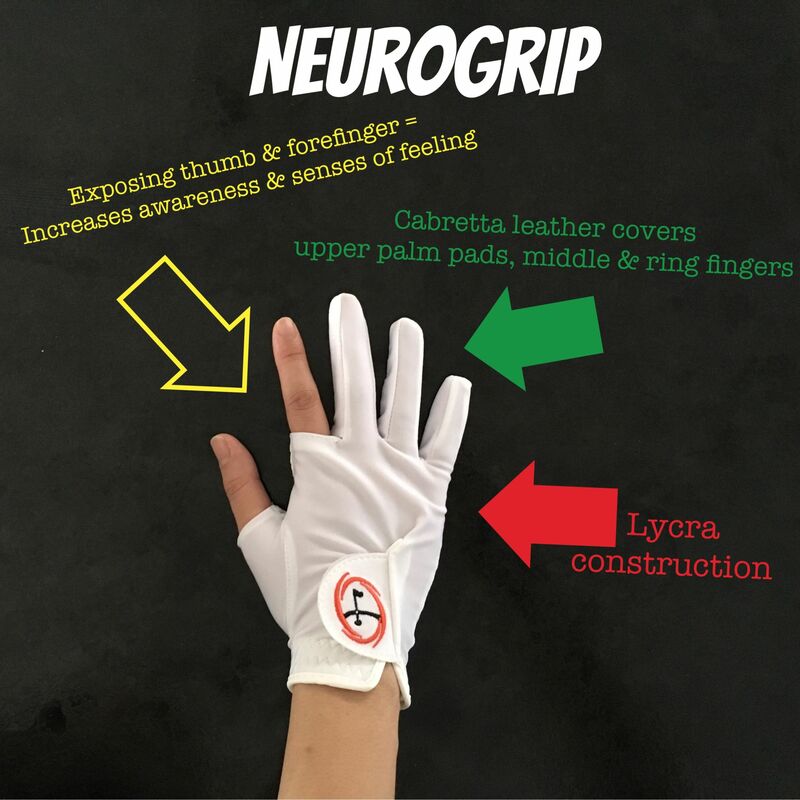 The Neurogrip should be worn as a pair with your current glove. We recommend ordering one to two sizes smaller than your usual size because the Lycra material can stretch up to five times its original length. This is a new product so there are not many reviews therefore we choose to perform testing. Golf gloves don’t last forever! Those made out of the synthetic material have to be replaced more often than their leather counterparts. The combination of sweat and heat can wear the material down. During our study we found the glove was very durable and had no defects. 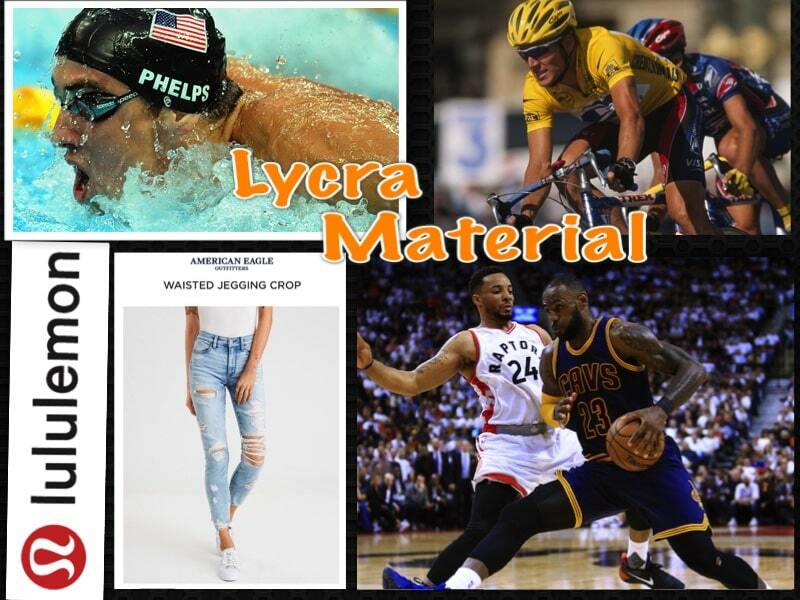 The Lycra material stretched back to its original shape in other words it did not stretch out over time. The Neurogrip by Exodus Golf is a neat golf glove that is worth giving a try. The price of this glove is $11.99 USD, which is inexpensive compared to some other golf gloves out on the market. Based on our testings, we found the Neurogrip to be a durable glove. Golfers that suffer from callouses and a sweaty palm may benefit from this glove. The composition of this glove adds protection, and the Lycra of the glove helps wick moisture and is also fast drying. We found that the glove helps enhance awareness for greater accuracy. Based on our launch monitor testing we saw major changes in direction with the Neurogrip compared to the regular glove setup. This demonstrates an enhancement of awareness and greater accuracy. We recommend using the glove when you are having trouble straightening out your shots. This was a short term study and it would be interesting to see how golfers can benefit from this glove with long term use. For example, would it help increase distance in the long term? We love that the glove has a scientific aspect to it…”neuroplasticity”. Everything we do and come across in our everyday lives is consider neuroplastic. Your brain is influenced by many factors everyday, for example after reading this review your brain will be different from before reading it. Based on our research into neuroplasticity we learned the shaping of our plastic brains is far too unique for there to be any single intervention thats going to work for all of us (There is no one size fits all approach to learning). Therefore, no one device will work for everyone, but based on our research we would recommend giving the Neurogrip a try! Why don’t golfers wear a glove on the dominant hand? 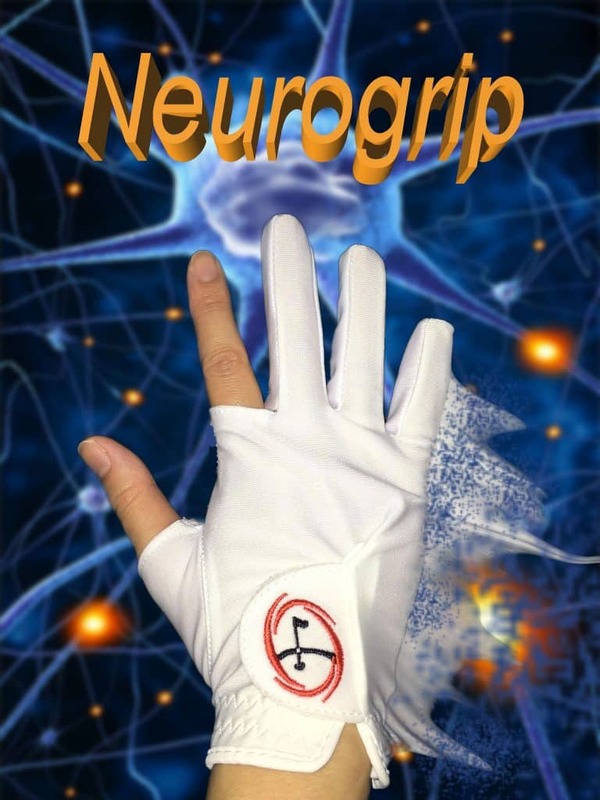 Top 5 benefits of using a golf glove, even more with a Neurogrip glove. Using power of the brain…to improve your game!